General settings consist of data object meta data including the coordinate system, field mappings, and source data information. General settings can be accessed by expanding the General node in the Settings tree. The settings in each sub-node are described below. The title bar of the General Settings window will include the name of the data object and the viewer in which the style settings apply. •Name: The name of the data object (read only) defined during import. •Type: The type of the data object, e.g., points, polygon, polyline. •Data Source: The folder path of the data source when the data was imported. •Color: The color of the data object when displayed in 2D and 3D Viewers. 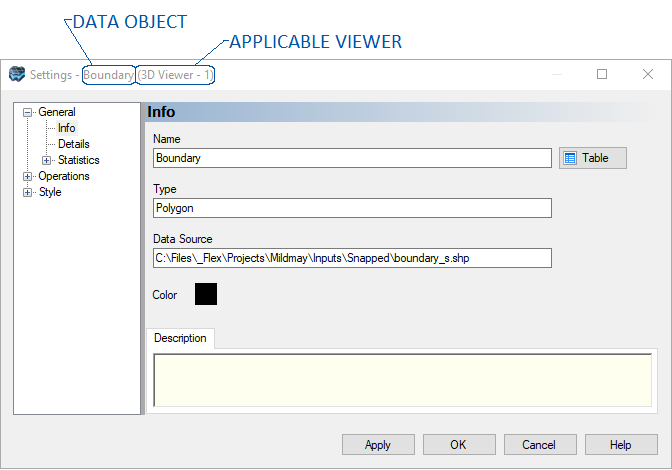 Click the color box to select a new color for the data object. •Description: The description of the data object as defined during import. This field is editable allowing you to update the description at any time. Table (Button):The table button allows you to view the geometry and attributes of the data object in a table view. For more information on the table view, please see "Viewing the Data Table" section. The Details node contains information on the coordinate system of the data object, and the field mappings specified during import. The Statistics node displays a count summary of the various data elements that comprise the data object. For example, for polygon data objects, the statistics node will show the number of polygons, polygon parts and vertices in the data object. For cross section data objects, the number of wells and cross sections is displayed. For Property and Structural Zone conceptual model objects, various statistics are automatically calculated and displayed under the statistics nodes, including: Min and Max X, Y and Z values, Area and Volume.